Are you overwhelmed with abuse@yourwebsite.com? Do your network staff spend too much time reading DMCA Takedown emails? Are you paying a lawyer to handle your Copyright Infringement emails? Compliance Program to the rescue. Why the DMCA Compliant Program? Who uses DMCA Compliant Service? Why use the DMCA Compliant Service? As an ISP, or webmaster your core business is NOT handling DMCA Takedown request cases. 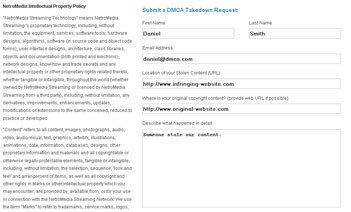 You have enough on your business plate before investing time, money and personnel to handle DMCA Takedown requests. Especially when all your cases are submitted through abuse@yourhost.com. Email Takedown submissions mean you have to read every one to determine their validity or accuracy. Of course most of the emails you receive do not follow the Takedown process as stated your policy page. The DMCA Compliant service increases your efficency it saves you time and money. This service almost eliminates false, invalid or ambiguous DMCA Takedown requests by ensuring users complete the form according to your policy. The service form ensures you are ONLY notified when a valid Takedown application has been made. Further the DMCA .comCompliant program goes a long way to inform copyright owners and ISP's that you follow an approved process, require certain information upfront and have an accessible DMCA Policy. DMCA .com Compliant members meet all DMCA .com requirements and take advantage of a DMCA .com Compliant badge to publicly display their approved status. Less invalid Takedown requests are filed when the DMCA Compliant badge is displayed. Certificate of Policy verification linked to from your DMCA Compliant badge. DMCA Takedown notices filed by individuals will have a better chance of adhering to your company's DMCA policy. Visitors, clients and designated agents will know your company follows strict rules when handling Takedown requests. Become DMCA Compliant and start getting only the DMCA Takedown notices that adhere to your DMCA policy. The Form: You can easily embed your own DMCA Takedown form with just one-line of code. It's cross-broswer compatible, secure and plugs directly into the Case Management system. The Badge: Becoming DMCA Compliant tells your users you adhere to the DMCA guidelines. You will get an optional badge to add to your website upon registration. How can I become DMCA Compliant? Simply register and submit all the required information - including a valid DMCA Policy, contact information, and Counter Claim information. 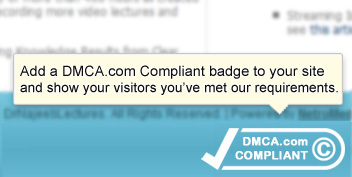 After your application is reviewed and approved you can add the DMCA Compliant Badge and form to your website. How much does it cost to become DMCA Compliant? There is no cost to becoming DMCA Compliant. However should you need website work, submit form customization, add-ons etc there may be additional charges for your particular set up. What requirements must a provider meet in order to become DMCA Compliant? Copyright Infringement or DMCA Policy specific to your company and subsequent counter claim information. Service providers who apply to become DMCA Compliant must show and keep a valid DMCA Policy. In addition, they are required to present valid contact information including a phone number, email address and contact address of the individual or department that will handle DMCA Takedown claims. Additional requirements are available to service providers who sign-up and begin the verification process. How do you make sure a DMCA Compliant badge is authentic? DMCA Compliant Badges are intended to be used by valid ISPs / OSPs that signed-up for the DMCA.com Compliance service. Sharing or re-production of DMCA Compliant badges is strictly prohibited. DMCA.com authentication system constantly monitors and detects both the validity of a DMCA Compliant badge and its paid-use.